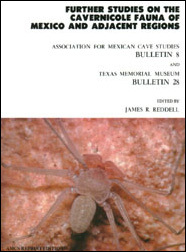 Among the many taxa described in this volume are fifty new species and subspecies of troglobite from Mexico. This brings the number of described troglobites in Mexico, Guatemala, and Belize to 330. Many of the newly described taxa are from the Purificación cave area in Tamaulipas and Nuevo León, the Huautla region in northern Oaxaca, or the Cuetzalan area in northern Puebla. A new crayfish (Decapoda: Cambaridae) from the state of Puebla, Mexico, with new locality records for Procambarus (Villalobosus) xochitlanae and entrocytherid ostracod symbionts, by H. H. Hobbs, Jr. The cavernicolous anchomenine beetles of Mexico (Coleoptera: Carabidae: Agonini), by T. C. Barr, Jr. The trechine beetles of the Paratrechus series in Mexico and Central America, with special reference to the cave species (Coleoptera: Carabidae: Trechinae), by T. C. Barr, Jr.